This appeared April 1 as a PNNL news release that includes video. Using atom probe tomography, PNNL researchers are able to create an "atomic map" of the arrangement of various atoms in this titanium alloy. Enlarge image. Results: An improved titanium alloy—stronger than any commercial titanium alloy currently on the market—gets its strength from the novel way atoms are arranged to form a special nanostructure. For the first time, researchers have been able to see this alignment and then manipulate it to make the strongest titanium alloy ever developed, and with a lower cost process to boot. They note in a paper published April 1 by Nature Communications that the material is an excellent candidate for producing lighter vehicle parts, and that this newfound understanding may lead to creation of other high-strength alloys. Researchers at the Pacific Northwest National Laboratory knew the titanium alloy made from a low-cost process they had previously pioneered had very good mechanical properties, but they wanted to know how to make it even stronger. Using powerful electron microscopes and a unique atom probe imaging approach, they were able to peer deep inside the alloy's nanostructure to see what was happening. Once they understood the nanostructure, they were able to create the strongest titanium alloy ever made. Why It Matters: At 45 percent the weight of low carbon steel, titanium is a lightweight but not super strong element. It is typically blended with other metals to make it stronger. Fifty years ago, metallurgists tried blending it with inexpensive iron, along with vanadium and aluminum. The resulting alloy, called Ti185, was very strong—but only in places. The mixture tended to clump—just like any recipe can. Iron clustered in certain areas creating defects known as beta flecks in the material, making it difficult to commercially produce this alloy reliably. About six years ago, PNNL scientists and their collaborators found a way around that problem and also developed a low-cost process to produce the material at an industrial scale, which had not been done before. Instead of starting with molten titanium, the team substituted titanium hydride powder. By using this feedstock, they reduced the processing time by half and they drastically reduced the energy requirements, resulting in a low-cost process in use now by a company called Advance Materials Inc. ADMA co-developed the process with PNNL metallurgist Curt Lavender and sells the titanium hydride powder and other advanced materials to the aerospace industry and others. Methods: Much like a medieval blacksmith, researchers knew that they could make this alloy even stronger by heat-treating it. Heating the alloy in a furnace at different temperatures and then plunging it into cold water essentially rearranges the elements at the atomic level in different ways thereby making the resulting material stronger. Blacksmithing has now moved from an art form to a more scientific realm. Although the underlying principles are the same, metallurgists are now better able to alter the properties based on the needs of the application. The PNNL team knew if they could see the microstructure at the nanoscale they could optimize the heat-treating process to tailor the nanostructure and achieve very high strength. "We found that if you heat treat it first with a higher temperature before a low-temperature heat treatment step, you could create a titanium alloy 10-15 percent stronger than any commercial titanium alloy currently on the market and that it has roughly double the strength of steel," said Arun Devaraj, a material scientist at PNNL and lead author of the paper. "This alloy is still more expensive than steel but with its strength-to-cost ratio, it becomes much more affordable with greater potential for lightweight automotive applications," added Vineet Joshi, a PNNL metallurgist. Devaraj and the team used electron microscopy to zoom in to the alloy at the hundreds of nanometers scale—about 1,000th the width of an average human hair. Then they zoomed in even farther to see how the individual atoms are arranged in 3D using an atom probe tomography system at EMSL, the Environmental Molecular Sciences Laboratory, a DOE Office of Science User Facility located at PNNL. By using such extensive microscopy methods, researchers discovered that by the optimized heat treating process, they created micron-sized and nanosized precipitate regions, known as the alpha phase, in a matrix called the beta phase—each with high concentrations of certain elements. "The aluminum and titanium atoms liked to be inside the nanosized alpha phase precipitates, whereas vanadium and iron preferred to move to the beta matrix phase," said Devaraj. The atoms are arranged differently in these two areas. Treating the regions at a higher temperature of 1,450 degrees Fahrenheit achieved a unique hierarchical nanostructure. When the strength was measured by pulling or applying tension and stretching it until it failed, the treated material achieved a 10-15 percent increase in strength, which is significant, especially considering the low cost of the production process. The team collaborated with Ankit Srivastava, an assistant professor in Texas A&M's material science and engineering department, to develop a simple mathematical model for explaining how the hierarchical nanostructure can result in the exceptionally high strength. When compared with the microscopy results and processing, the model led to the discovery of this strongest titanium alloy ever made. What's Next? "This pushes the boundary of what we can do with titanium alloys," said Devaraj. 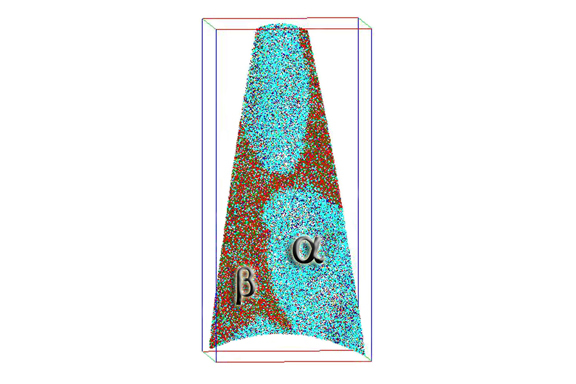 "Now that we understand what's happening and why this alloy has such high strength, researchers believe they may be able to modify other alloys by intentionally creating microstructures that look like the ones in Ti185." Sponsor: This work was supported by DOE's Vehicle Technologies Office Propulsion Materials Program and the Chemical Imaging Initiative, a Laboratory Directed Research and Development program at PNNL. Research Team: Arun Devaraj, Curt A Lavender, Vineet Joshi, and Sandeep Manandhar (PNNL); Ankit Srivastava (Texas A&M University); and Vladimir Moxson and Volodymr Duz (ADMA Products).